Evaluating which analytics technology to buy or build for your product involves many technical design and operational decisions but the best results are achieved when prefaced by plans for product sales growth. 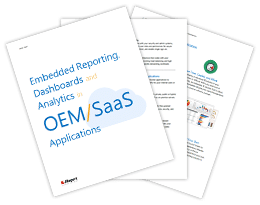 Based on insights gained through JReport’s experience working with ISV/OEM customers, this eBook discusses three ways that enhanced reporting and analytics features boost sales of your core product or service. One of the major challenges with making BI and analytics investments is trying to choose a future-proof technology while avoiding costly features that we may never use. 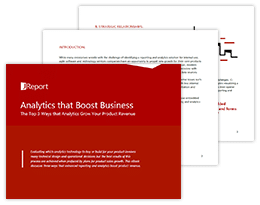 This eBook describes the key capabilities that product, IT, and business owners must consider when charting a plan to scale up business benefits from data and analytics. 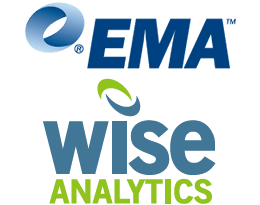 Eager to enhance commercial products and services with analytics, enterprises reveal key struggles and opportunities in delivering these customer-facing insights along with their plans for analytics in the cloud. Instead of purchasing BI tools and training their users to address their own needs for data and insight, many companies are taking a more tailored approach in supplying enterprise business users with analytics: incorporating context-sensitive charts and reports within existing core business applications. This eBook shares key insights that help IT and business unit owners plan for embedded analytics enhancements to their applications. With multiple high priorities and limited resources, product owners need better answers for their customers’ appetite for data and analytics. This eBook discusses major BI and analytics capabilities that companies can embed as self-service functionality within their products and services to empower more customer productivity and better results. With enterprise BI and analytics leaders in mind, this white paper summarizes the main styles of reporting and analysis to serve as a reference for evolving enterprise BI strategies and solution portfolios so they effectively address different users and analytics scenarios across the enterprise. One of the major challenges with incorporating analytics and reporting functionality into commercial platforms is how to manage performance and scalability without impacting other service components and launch dates. This eBook provides 10 important considerations – along with a description of how JReport addresses them – when designing your BI and analytics environment for performance and scalability. When analytics are part of your core product, buyers need to ensure that they perform within specific technology, performance, functional, and branding contexts. Embedding the right analytics technology should help differentiate and strengthen your customer value proposition. This eBook shares insights gained through JReport’s experience with OEM/ISV/Embedded customers. 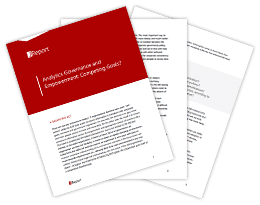 With the needs of different departments, roles, and types of users in mind, this article describes five analytics imperatives that CXO’s and Data Leaders should consider when developing or refining a strategy for comprehensively addressing analysis and insight needs across the entire enterprise. With customers and users in mind, this article summarizes the different styles of data analysis and visualization in use today to guide commercial product owners and development leaders in selecting embedded analytics software products that will provide their end users with the BI and analytics they want. There are two key pressures on today’s IT organizations: Business users want “self- service” while the CxO suite wants to ensure information is compliant with corporate goals, contracts and government regulations. This eBook describes the issues of governance and empowerment, and then provide ways to balance these two important needs. 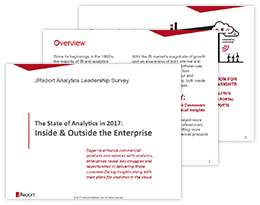 Jinfonet Software, through its reporting and dashboarding applications, helps embed analytics capabilities into line-of-business (LOB) transactional applications. The vendor’s solutions are designed to be customizable and interoperable so as to blend into LOB applications’ native environments. We believe that Jinfonet’s offerings are highly relevant to enterprises that would like to extend analytical capabilities to a wider group of business users, but without a rip-and-replace of existing applications or the need to train users in new technologies. Read the white paper to learn how you can offer reporting and analytics capabilities to your users without having to internally develop an in-house solution. See how you can seamlessly integrate a reporting and dashboard solution to make it your own. The white paper also includes a case study about NICE Actimize and how they embed reporting capabilities to provide robust financial fraud detection solutions to their customers. The practices and implementation of Business Intelligence (BI) are no longer reserved for large enterprises with dedicated IT teams. BI practices such as reporting and analytics are making their way to businesses of all sizes. Mid-sized organizations find themselves in the midst of the same data tsunami that larger organizations have been experiencing for years. They discover that not only can they implement BI practices and environments, but that those practices also provide them with competitive advantages. This white paper presents the Top 10 Ways to Visualize Data with JReport. Topics covered range from the new JDashboard and Visual Analysis, to specific interactive functions like drilling and filtering, as well as visualization features like chart types and styles. This paper illustrates features in JReport that help users work with their data like never before. JReport’s performance and scalability have been documented by benchmark testing and demonstrate an effective utilization of available resources in order to deliver precise reports with high efficiency. Learn how JReport effectively utilizes all available resources and efficiently delivers precise reports and provides enterprises with a high performance, scalable reporting solution. One of the major challenges with Business Intelligence is how to manage performance and scalability without impacting other production applications. There are many facets to ensuring your users can get access to their data and analyze it in real time without having to wait long periods or schedule reports for overnight delivery. Determining which company offers the right embedded BI reporting solution for your organization can be challenging. Many of today’s tools are complex, sophisticated and difficult to learn, requiring specialists or the investment of significant training costs. Whether the need is an out-of-the-box solution or a toolkit to embed in a custom Java EE application, JReport provides a reporting solution that precisely meets end-user requirements. Independent Software Vendors face a unique set of challenges when trying to incorporate a reporting solution. For ISVs, issues such as rapid development, customization, cross-platform support, installation, licensing and API flexibility are compounded by the number of clients they serve. 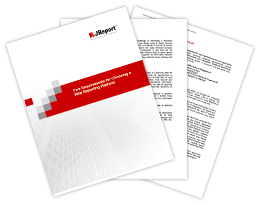 Learn more about how JReport’s flexible Java reporting solution comprehensively addresses all the ISV’s requirements. Security cannot be overlooked when comparing features of BI tools. It is smart to ensure that the BI tool that you choose has all of the options you need to not only manage the security of the report data, but also to manage the resources, file permissions and disk resources. JReport is the only product which provides all of these features out of the box without any additional costs: they are all included in the base product. Evaluating reporting solutions can be a challenging task. The market is crowded with vendors trying to get your attention. 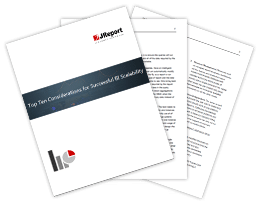 It is important for you to consider these 10 critical issues to give yourself the best chance of recommending and investing in a solution that can meet your enterprise needs today and into the future. And, before you buy, make sure you get an evaluation copy of the software to determine for yourself how easy the solution is to integrate, scale, and use.